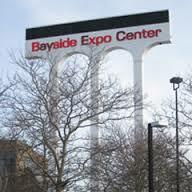 Bayside Expo Center: This obsolete sign straddles property owned by Corcoran Jennison and UMass Boston. It's removal has become part of the stalemate on the site.One major element of the now-defunct Boston 2024 proposal would have consolidated a complicated jigsaw puzzle of privately held property on Dorchester’s Columbia Point to build a huge Athletes Village complex. In an updated plan released in June, Olympics boosters proposed enlisting a “master developer” to cobble together various parcels on the peninsula and execute the construction of the 100-plus acre compound. While still largely in a conceptual phase, the master developer concept won favor from Columbia Point stakeholders, in part because it held the promise of bringing new order to what one key landowner says has become an stalemate on the Bayside section of the peninsula. Three principal interests – the University of Massachusetts at Boston, the Boston Teachers Union, and Corcoran Jennison Companies – are all seeking to build out projects of varying sizes and uses on the Bayside properties. All three were in talks with the Boston 2024 planners on how they might agree to divide up and re-use the Bayside site with the Olympic Village in mind. Now that the Olympics concept is off the table, it remains to be seen how pre-existing plans for development on the sites will move ahead— and how quickly. Corcoran later expressed a growing frustration with UMass Boston, which controls the largest swath of the Bayside properties, the former Exposition Center and surrounding parking lots that the university acquired for $18.7 million in 2010. Corcoran said that two major projects that his company has been planning to build – regardless of the fate of the Olympics – are now being held up because UMass officials have not communicated with him in recent months. 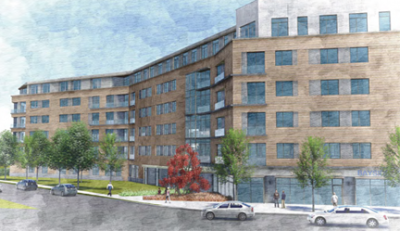 University PlaceCorcoran Jennison has BRA-approved plans in hand to expand the DoubleTree Hotel at Bayside and to construct a 184-unit apartment complex called University Place at the entrance to Mt. Vernon Street. Both projects, Corcoran said, have been delayed because the projects will be built close to UMass-controlled land that would be needed for utility easements. Taken together, the two Corcoran development projects have an estimated development cost of $68 million. The Reporter is a tenant in the Bayside Office Center, a Corcoran Jennison-owned property on the Point. Meanwhile, UMass Boston is planning to demolish the old Bayside Expo structure this summer to make room for temporary parking on the site to serve UMass students. But Corcoran said that the demolition has itself been snarled in the impasse as both sides seek to resolve their land-use issues. Ed Lambert, chancellor for Government Relations and Public Affairs for UMass Boston, said earlier this week that the university is “anxious” to continue conversations with other landowners on Columbia Point to resolve a festering issue with untangling utility lines that would enable further build-out. “Certainly our hope is that we can accomplish that as soon as possible,” Lambert said. Phillip Johnston, who serves as chairman of the UMass Building Authority, said on Wednesday that he is confident that the parties at Bayside will work out a deal. How the dynamics of the failed Olympics bid will impact decisions on the peninsula in the days and weeks to come will be closely watched. UMass Boston Chancellor Keith Motley was one of five key ambassadors who pitched the Boston bid to the USOC in December, which ultimately helped Boston best the three other competing host cities of Los Angeles, San Francisco, and Washington, D.C.
That plan, Lambert said, includes demolishing the current Bayside Expo Center to create temporary parking, constructing two new parking garages on campus over the next three to four years, and creating additional academic space. The university is also in the midst of selecting a private developer to build its first round of dorms on the footprint of its academic campus. “If and when the university does look to start building, we know for any future development that we want to have similar conversations with residents and city to make sure there are similar conversations into how we can expand and grow,” akin to the city-wide neighborhood meetings on the Olympic proposal, Lambert said. Corcoran, meanwhile, said he was surprised when the bid was pulled. His company owns and manages the adjacent Harbor Point housing development, along with properties within the footprint of the proposed Athletes Village, and he had been impressed by the more detailed Bid 2.0 proposal put forth by Olympic proponents last month. “I was excited about that. It seems from the mayor’s comment that the area would be a good area for housing and those infrastructure improvements would be good. I hope it’s not all for naught. I hope some of those plans – which were very good – are given further consideration,” said Corcoran. For Richard Stutman and the Boston Teachers Union— whose building is immediately adjacent to the Corcoran Jennison and UMass holdings— it’s full steam ahead to demolish their current headquarters and replace it with one twice its size. Unless, Stutman says, something better comes along.